Don't use 30-30 powder charges in a 7.62x39. The case volume is smaller and high pressure will result. Get your charges from a loading manual. I purchased one of the Lee 113 grain RNFC bullet molds (C309-113-F). I have cast up some bullets with it using straight WW material and then I have heat treated them to attain a BHN of around 20.1 according to my Lee hardness tester. These were sized at .311 before the heat treatment and they do measure .311. I'm looking for an accurate flat shooting load out to 100 yards if possible with this bullet. I know some of you have reported accuracy problems with these bullets at this range but I thought I would give them a try. I'm using 2400 as my powder of choice for these loads. They are crimped using the LFCD as this bullet has no crimp groove. Last time out the loads at around 20 grains looked the most promising for accuracy. I have some loaded up with 20.2, 20.4, and 20.6 grains of 2400 to try out in the morning. I may run a few over the chronograph to check the velocity. These will be shot from my 336C with the micro-groove barrel. I have enjoyed all of the input on this thread and hope all who have contributed to it to keep us updated on your results. Shooters. We are a community. United we stand divided we fall. NEAT! Best of luck with your testing. Actually, the top groove can be used as the crimp groove. I have pushed that Lee bullet to over 2,700 f.p.s. with good accuracy. The 1st shot was the fouling shot and the next 4 printed into a .91" group. That looks good. I hope I can get there myself with this bullet. I'm still working on some loads for it and my gun had a scope issue last time out. I hope I can get back out this week or next week and continue on with the load development. I also have some of the bullets you gave me loaded up and ready to shoot. In looking back over my records I found where I tried 17/2400 and that shot reasonably well. Velocity was over 2,000 f.p.s. In straight w.w. (not heat treated), I find that 8/Unique shoots well at about 1,500 f.p.s. as does 7.5/231. Hope those bullets I sent shoot some nice clusters for you. Thanks for your information on using the 2400 and this bullet. I loaded up five rounds using 20.2 grains of 2400 and the results were mixed. I shot three rounds of 170 grain hard cast bullets through the clean barrel. 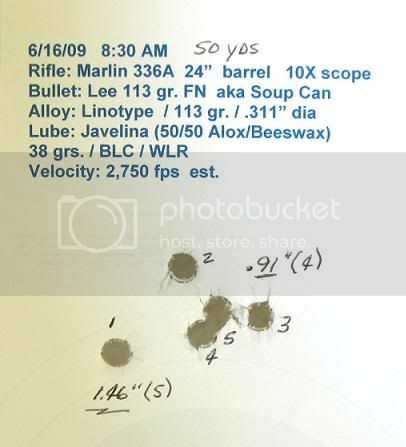 After a cool down period I shot two of the 20.2 grain 2400 loads with the Lee 113 grain RNFC bullet and the resulting group measured right at 1.5 inches. This is at 100 yards from a bench rest. I let the gun cool and then shot the last three rounds and the group opened up to over two inches. Next time out I will load up 20 rounds of the 20.2 grain 2400 load. I may adjust the seating depth of the bullet as you have suggested earlier to reduce bullet jump and see if that will improve the group size. I also want to run some of these over the chronograph to see the results. I took with me ten rounds using some of the bullets you sent me and found out I need to seat the bullets deeper so they will fit in the chamber. I should have checked them before leaving for the range. I'll fix them and shoot them next trip. These light bullets are a lot of fun to shoot and experiment with. I haven't read all the way through this thread yet, but thought I'd give some info on what I've done concerning 0 buck shot in 30/30. I picked up a 5LB box of Hornady .320 diameter 0 buckshot a while back and just recently picked up a Lee .309 bullet sizer die with alox and a RCBS Cowboy expander die and ran the buckshot through the alox and sizer die. Haven't tried the resized buckshot in 30/30 cases yet, but will do so on Sunday (tomorrow), and will let you know how it works. I don't have the 30/30 rifle right now, just turned it over to a gunsmith for mounting a XS scout rail w/ Leupold Scout Scope and recoil pad, it should be back in about 6 weeks (the gs is running that far behind). I tried loading some of the resized 0 buckshot in once fired WW cases after running them through the expander die just enough to open the case mouth enough to start the ball and was able to push it in far enough to LIGHTLY crimp the ball in place using 1 gr Bullseye. Now to sit around and wait for my 30/30 to come back from the gunsmith. I'm a bit curious, has anyone here tried IMR Trail Boss for light bullet loads? I have and several others have too. They are good for light recoil and slow moving slugs. They are fun to shoot. I worked up a load for small game. It's a load that will be on my recipe book. Back in 1989 during a move, I lost my data that I had saved over the years. Now I have several copies and I have that in my Excel spread steet. When I get a chance, I plan on getting back to reloading. I have several styles of light bullets that I will use IMR 3031, SR4759, BL C-2, 2400 and of coarse Trail Boss. You can check out my thread on for the 86 grain bullet that I used Trail Boss here https://www.marlinowners.com/forums/i...c,47684.0.html .